Enhance your business with these utilities. Online forums have been in trend after the successful launch of professional websites or blogs. Being a discussion platform, these forums help the website’s customers to share their views on any topic. A website associated with e-commerce businesses or about SEO connected topics even holds a forum in it. Basically, the forum served as a unified platform for enterprises. Hence, allows the users for discussing, preparing, and clearing their doubts. Forum platforms are highly helpful, therefore being featured with numerous websites of multiple niches. In case, you are a Linux user and thinking to begin a forum to assist others you can go for any forum software. It will help you to build a community. 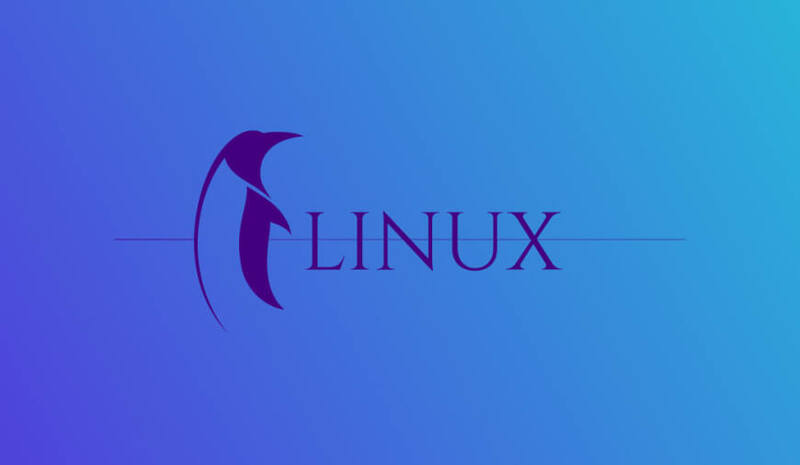 Here, comes the question that how to choose open forum software for Linux? Is it tough? The answer is no, it is not. We are going to reveal 10 best open source forum software for Linux systems. Have a look on the list quickly. It is one of the top forum solutions for almost a decade. In spite of its somewhat outdated look, this forum platform remains famous among users. This is because of its wide variety of settings. Allows user and permission management settings. Provides a template, as well as a package management system. Gives users Search Engine Optimization (SEO) options. Offer advanced security settings, such as IP blocking and time-outs. The next forum platform is bbPress. It is designed to work on the WordPress Content Management System (CMS) as a plugin. The platform is supported on most WordPress themes, and it is under frequent development, which is a plus. Works on top of WordPress. Provides a simple set-up and clean forum experience. Comes up with a complete guide installer. Offers the option to segregate your forum into different sections. vBulletin offers numerous forum solutions and vBulletin Connect is one of them. It can be purchased by a license, with sufficient features, in order to warrant the price tag. This is one of the popular paid forum software. It is one of the oldest forum projects. The first edition was shipped near the end of 2000. Since then its development has moved forward gradually. Now, it is considered to be the most popular forum solution. Offers a robust extension system. 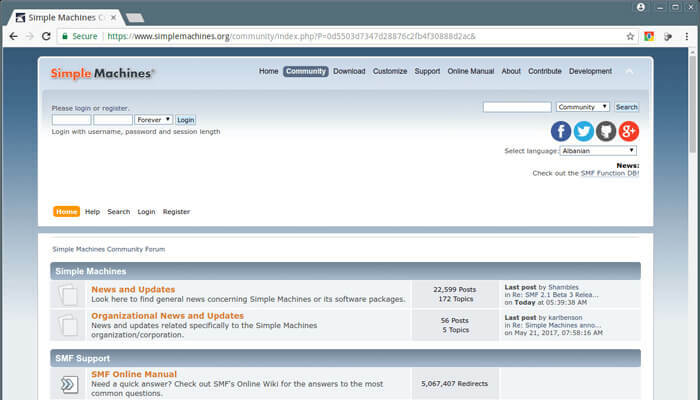 Optimizes your forum for the search engines. Supports login through third-party services, such as Facebook and Google. Advanced caching system, in order to increase the performance. It doesn't look like the other picks we’ve covered, at first glance. 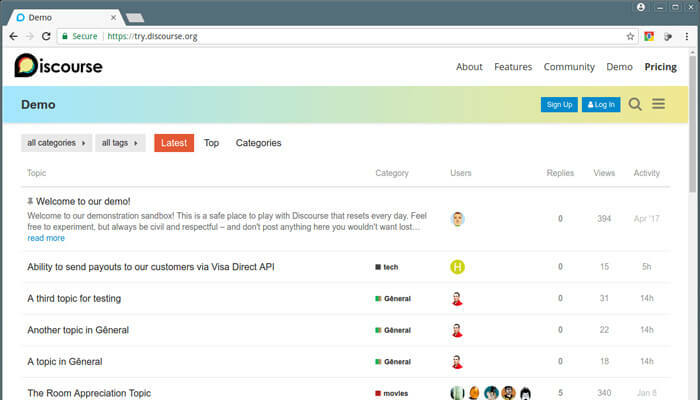 Discourse is forum software, but quite modern. Most of its features are optimized for mobile phones, and the platform looks smooth on all of them. Developed for use on touch devices. Provides a ‘Like’ function for posts. Have a robust plugin system. Login can be done via Google, Twitter, Yahoo, and Facebook accounts. Price: It is free of cost, but also gives forum hosting packages. Another robust forum software to create forums. It offers well-designed pages for numerous communities. IP. Board is a perfect tool to make superb websites and enhance the experience for viewers. Ability to create new topics every time. 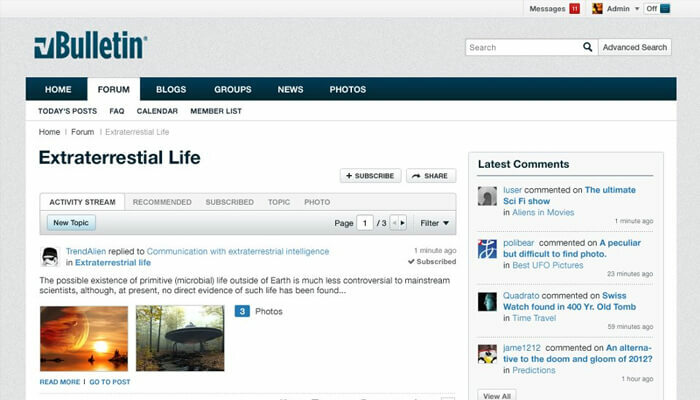 Blogs and chat facility, enabling improved functionality. Price: Available in both free, as well as paid versions. This is one of the intuitive extensible forum software, providing a highly flexible community. 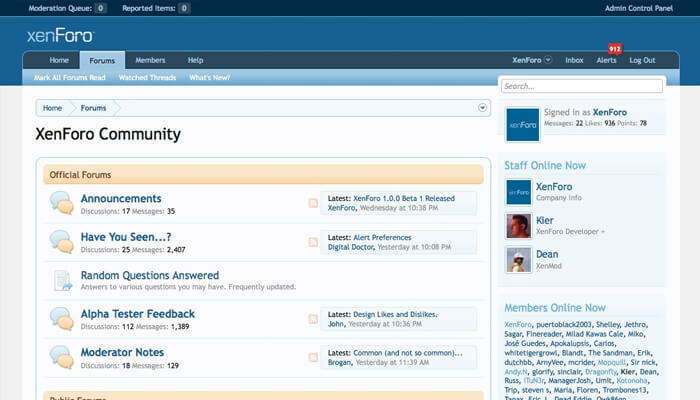 XenForo offers durability, speed, and compelling community exercises. Price: The cost of 1 to 2 licenses is $140. It features free of cost hosting for the forums, offering wonderful service for the development of the online community. Zetaboards works like an excellent place to meet, discuss, and share information. It has huge popularity and has been used by numerous people around the world. Extremely customizable forum software that enables the users to modify the look and feel in accordance with the community. Gives a simple platform with splendid features to build an exceptional forum. This forum software is specifically developed to offer a quick and lighter substitute of the heave forum applications. Its latest edition is much more safe and secure. Moreover, fluxBB has become more stable now. 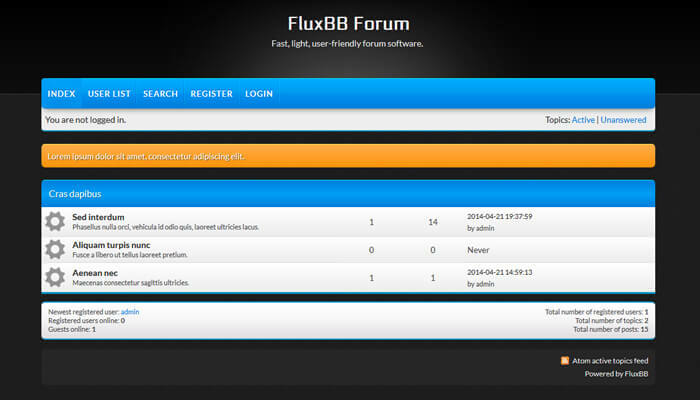 Being an open source forum software, it provides you the ability to function independently from one hardware smoothly. It is a highly customizable platform, making it preferable to build an interesting discussion forum. After considering the importance of forum software, I have mentioned 10 best forum software for Linux. In case, you are interested in setting up a forum for your website or blog, it is crucial to know which open source software should you use. Hope, by now, you are able to pick one for your business.